Heat ghee in a non-stick pan and fry the dry fruits of your choice. Remove the dry fruits and keep aside. Fry the maida in remaining ghee till nice aroma comes. Keep it on low flame. Remove from the heat and mix sugar and 1/2 cup water to maida. Make sure it doesn’t form any lumps. Keep stirring it and keep it back on stove. 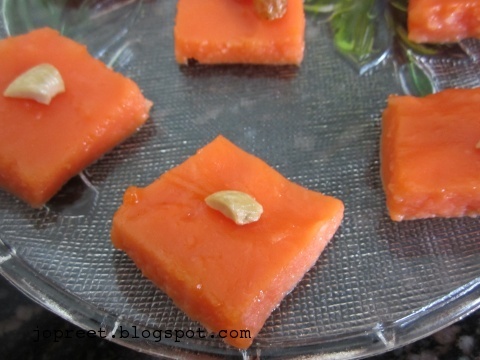 Add 1/4 tsp of orange color and stir the halwa till it reaches the halwa consistency(little sticky). 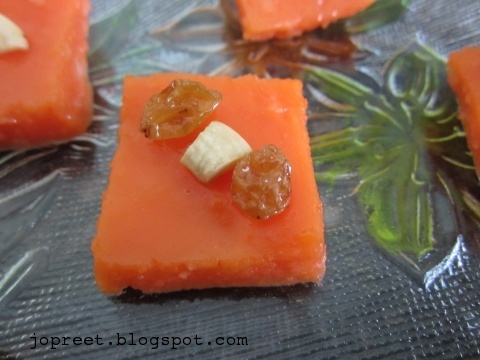 Grease a plate or tray and pour the halwa on it. Allow it to cool and cut into diagonal or rectangular pieces. Garnish with the fried dry fruits. I love sweets! 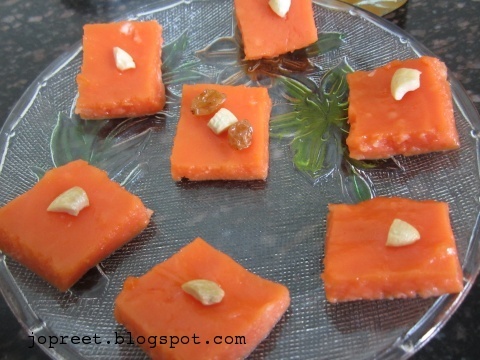 Halwa looks delicious!